Preparations are in full swing for Women’s History in the Digital World 2015, the second conference of The Albert M. Greenfield Digital Center for the History of Women’s Education, which takes place this Thursday and Friday, May 21-22, at Bryn Mawr College. We are delighted to welcome more than 130 conference participants to campus later this week–including a number of presenters who joined us for the inaugural conference in 2013. The Greenfield Digital Center has been proud to support the work of Praxis III independent study students Emma Kioko ’15 and Grace Pusey ’15, whose semester-long project Black at Bryn Mawr includes a new walking tour of campus featuring their research. 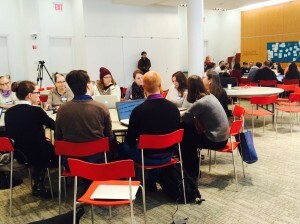 In February, Grace shared the origins of the project with readers, and since that time, they have presented their work-in-progress at Bryn Mawr’s Community Learning Day in March and at the Telling Untold Histories unconference earlier this month. Emma and Grace will debut their walking tour on campus the week of April 21. For more details, see their blog, Black at Bryn Mawr. The project will also be featured at the final Friday Finds event of the semester, this Friday, April 24 from 4-5pm in Canaday 205 (Special Collections Seminar Room). 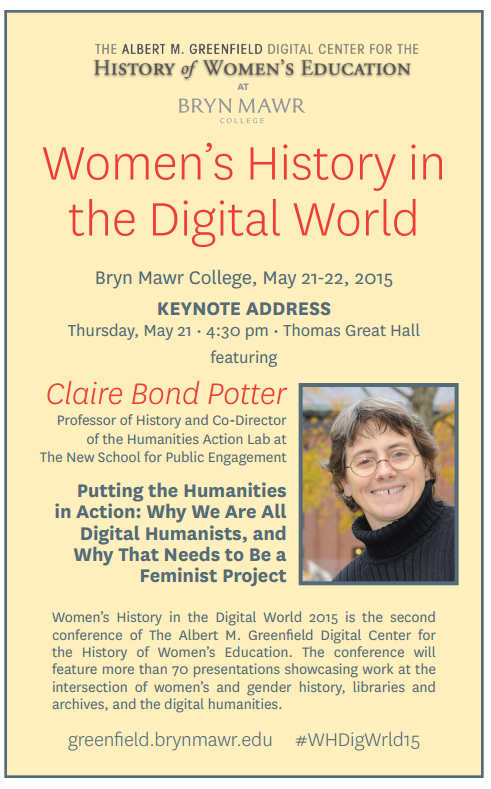 In May, Grace will debut the project’s digital component, a map of campus built on Google Open Tour Builder, at Women’s History in the Digital World 2015. 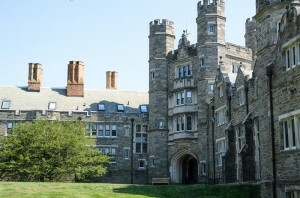 Future project-related events will be featured on the Black at Bryn Mawr site. The Greenfield Digital Center is currently supporting the work of three students undertaking Praxis III independent study projects exploring lesser-known aspects of Bryn Mawr College history. 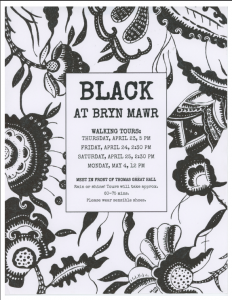 This week, two of those students — Grace Pusey and Emma Kioko, both Class of 2015 — are formally launching their research project, Black at Bryn Mawr. 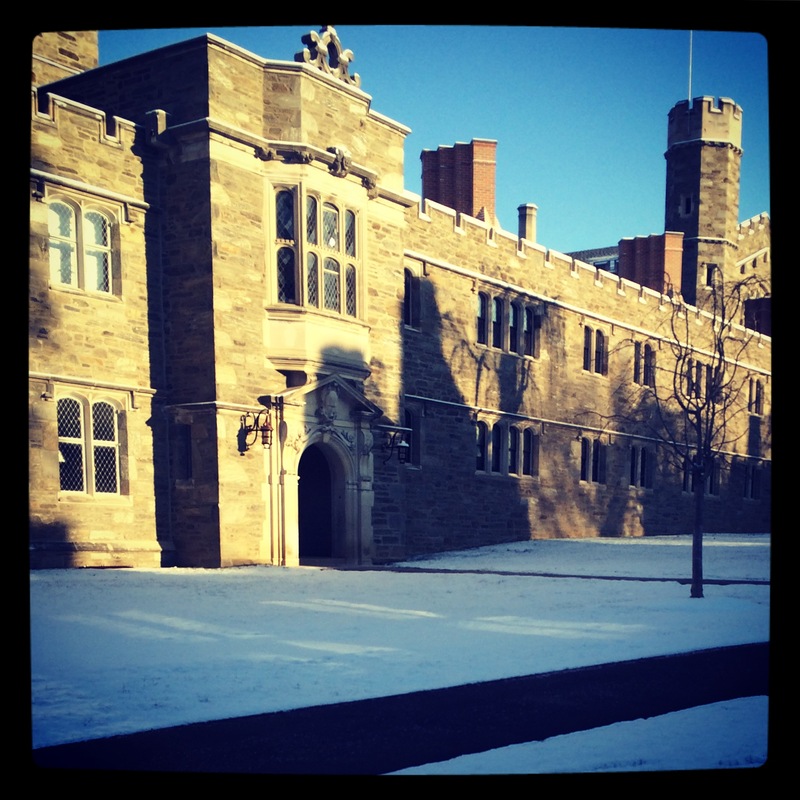 Readers can stay up-to-date with their research via the Black at Bryn Mawr blog and tumblr. Today, Grace shares the origins of the project, and its goals. 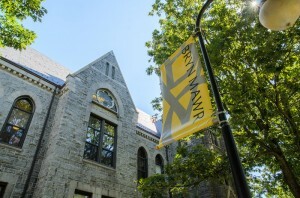 This semester Emma Kioko and I are collaborating on a Praxis III independent study course titled Black at Bryn Mawr, a project that will illuminate the history and experiences of Black students, faculty, and staff at the College. Using Bryn Mawr Special Collections as well as primary sources archived outside of the College, we are analyzing the ways in which Bryn Mawr has chosen to record, remember, and represent racism in its history. 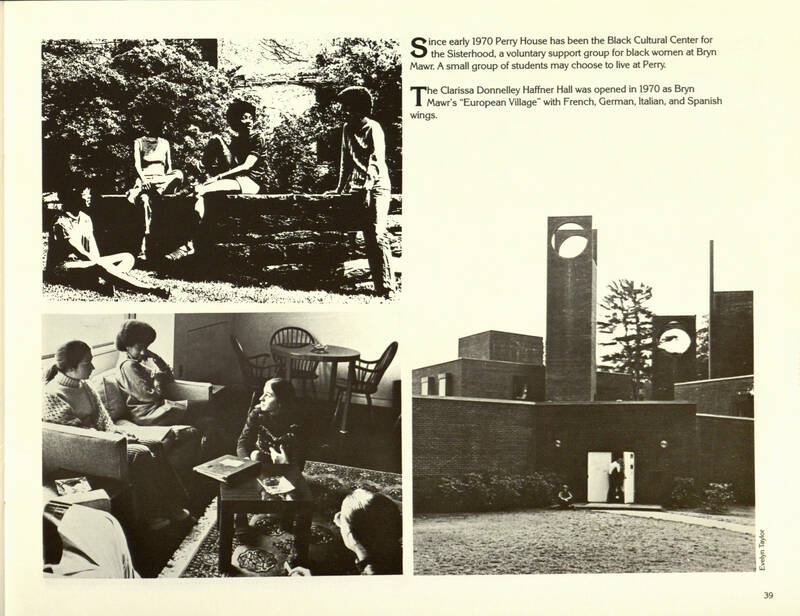 Using the archives, we are identifying spaces of both racial conflict and conversation on campus in order to develop a final project in the form of a campus walking tour and a digital historical record. 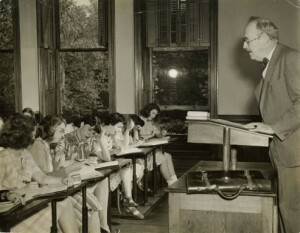 Professor Samuel Clagget Chew’s Bryn Mawr College classroom, undated, via Triptych. This semester I’m back in the classroom, teaching a History Department seminar “Higher Education for Women: Bryn Mawr and Beyond.” With apologies to Professor Samuel Claggett Chew (pictured left), my class of smart Bryn Mawr third- and fourth-years looks absolutely nothing like the lecture class of old. We divide our time between the classroom, Special Collections, and a course blog** linking past and present. Although my students aren’t tweeting this semester, I’m tracking my class prep on Twitter (reviving the hashtag #bmchistory) and I look forward to using this space for reflecting on teaching the course and the research that it inspires. 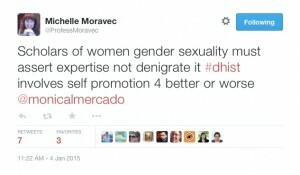 But today I wanted to put a call out to historians of education — how do you teach women’s higher education, in the U.S. and abroad? 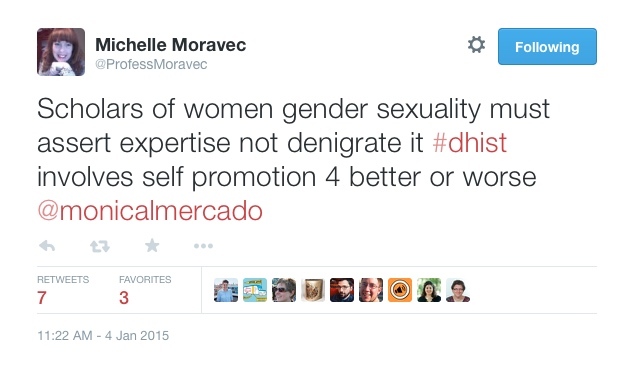 Similarly, how do women’s historians include the history of education in their teaching? Might we begin sharing our syllabi and readings with each other, online? “Syllabi show how scholars put together a whole field,” reminds historian Lincoln Mullen in a recent Religion in American History blog post. “Yet unfortunately teaching documents are shared less routinely than our research, so we are much more likely to know a scholar’s books and articles than her syllabi.” This year I’m planning to overhaul the “Classroom” section of the Greenfield Center website, which currently focuses on high school lesson plans, by adding college-level syllabi and resources — much like the CLGBTH does for teaching histories of sexuality. [The Open Syllabus Project offers another intriguing model for analysis and visualization of what we teach.] In part, I’m curious to learn if and how women’s education history is being taught these days, but most of all, I continue to hope we can be more vigilant about sharing our work in the classroom, as much as we remember to share our research and digital projects. ** Students were given the option to blog anonymously, although no student has yet to choose this option. On student privacy and class blogging (or other instances of student work online that may be publicly visible), I’ve consulted this list of resources collected by Whittier College DigLibArts.